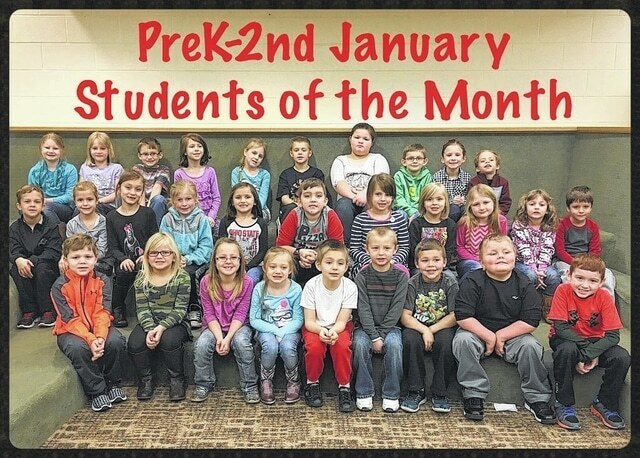 The Miami Trace Elementary School recently named the K-2 January students of the month. Front row: Drew Sharp, Aliya Wolffe, Audrey Campbell, Jenna Wisecup, Zachary Lewis, Javen Palmer, Bailey Miller, Xander Cummings and Grayson Harris. Middle row: Caleb Esker, Emily Parsley, Aubrey Creed, McKenna Payton, Emma Hoppes, Kyler Leisure, Tillie Abbott, Kelsie Mullen, Karlee Knisley, Adelaide Anderson and Isaiah Langley. Back row: Emaleah Phillips, Anna Langley, Anthony Shipley, Kyah Stickel, Mercedes Keller, Judson Layman, Lindsey Lightle, Joenus Eakins, Allison Carter, Kale Snodgrass Not Pictured: Maria Jackson, Lincoln Rhoades and Karis Fallon. 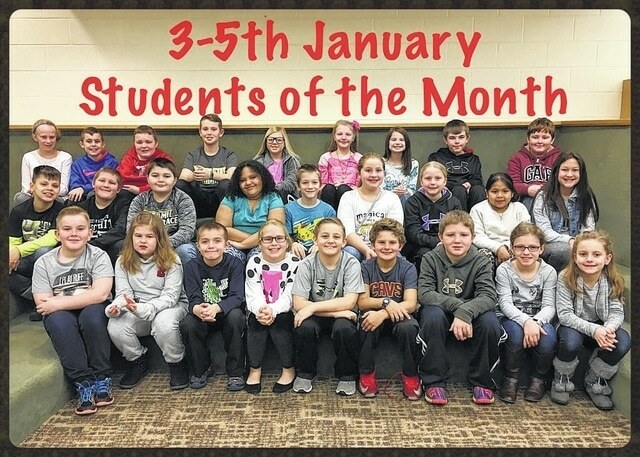 The Miami Trace Elementary School recently named the 3-5 January students of the month. Front row: Adam Throckmorton, Ashlynn Bookwalter, Kooper Hicks, Abbey Noble, Blake Boedecker, Luke Armstrong, Klayton Bellar, Ellie Hoppes and Kaylee Everhart. Middle row: Liam Rhoades, Ben Womack, Brady Sheets, Shyla Montgomery, Lincoln VanLandingham, Madison Cory, Carley Payton, Asucel Cruz and Sophia Schirm. Back row: Libby Johnson, Bryce Stuckey, Carson Hawk, Garrett Guess, Aerris Shiltz, Madison Barnes, Katelyn Gardner, Justin Pence and Jacob Speakman. Not pictured: Herbie Queen and Sophia Silva. https://www.recordherald.com/wp-content/uploads/sites/27/2017/02/web1_K-2.jpgThe Miami Trace Elementary School recently named the K-2 January students of the month. Front row: Drew Sharp, Aliya Wolffe, Audrey Campbell, Jenna Wisecup, Zachary Lewis, Javen Palmer, Bailey Miller, Xander Cummings and Grayson Harris. Middle row: Caleb Esker, Emily Parsley, Aubrey Creed, McKenna Payton, Emma Hoppes, Kyler Leisure, Tillie Abbott, Kelsie Mullen, Karlee Knisley, Adelaide Anderson and Isaiah Langley. Back row: Emaleah Phillips, Anna Langley, Anthony Shipley, Kyah Stickel, Mercedes Keller, Judson Layman, Lindsey Lightle, Joenus Eakins, Allison Carter, Kale Snodgrass Not Pictured: Maria Jackson, Lincoln Rhoades and Karis Fallon. https://www.recordherald.com/wp-content/uploads/sites/27/2017/02/web1_3-5.jpgThe Miami Trace Elementary School recently named the 3-5 January students of the month. Front row: Adam Throckmorton, Ashlynn Bookwalter, Kooper Hicks, Abbey Noble, Blake Boedecker, Luke Armstrong, Klayton Bellar, Ellie Hoppes and Kaylee Everhart. Middle row: Liam Rhoades, Ben Womack, Brady Sheets, Shyla Montgomery, Lincoln VanLandingham, Madison Cory, Carley Payton, Asucel Cruz and Sophia Schirm. Back row: Libby Johnson, Bryce Stuckey, Carson Hawk, Garrett Guess, Aerris Shiltz, Madison Barnes, Katelyn Gardner, Justin Pence and Jacob Speakman. Not pictured: Herbie Queen and Sophia Silva.